SH's office mates often bring in food, so he asked me to bake. Last week I sent in brownies. 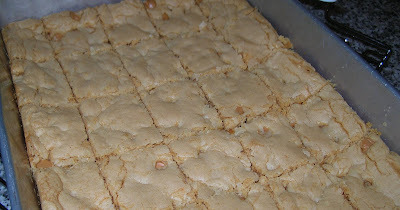 Yesterday I decided to try making cookie bars using an orange cake mix. I deemed them yummy, so this morning I layered them with wax paper, and packed them with an ice pack, so they would arrive intact. SH had a few stops to make before the commute into the city, and the car's interior tends to get a tad hot. I would eat melted, mushy baked goods, but I do draw the line in serving them to others. 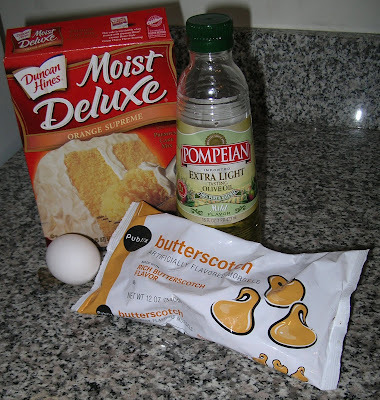 Mix cake mix, egg, oil and water in a bowl until almost all the lumps are gone. Bake in a greased 9 X 13 pan at 350 degrees for 20-25 minutes. Before sending to your husband's office, taste to be sure they pass the test of baking with a cake mix. Whatever that means.